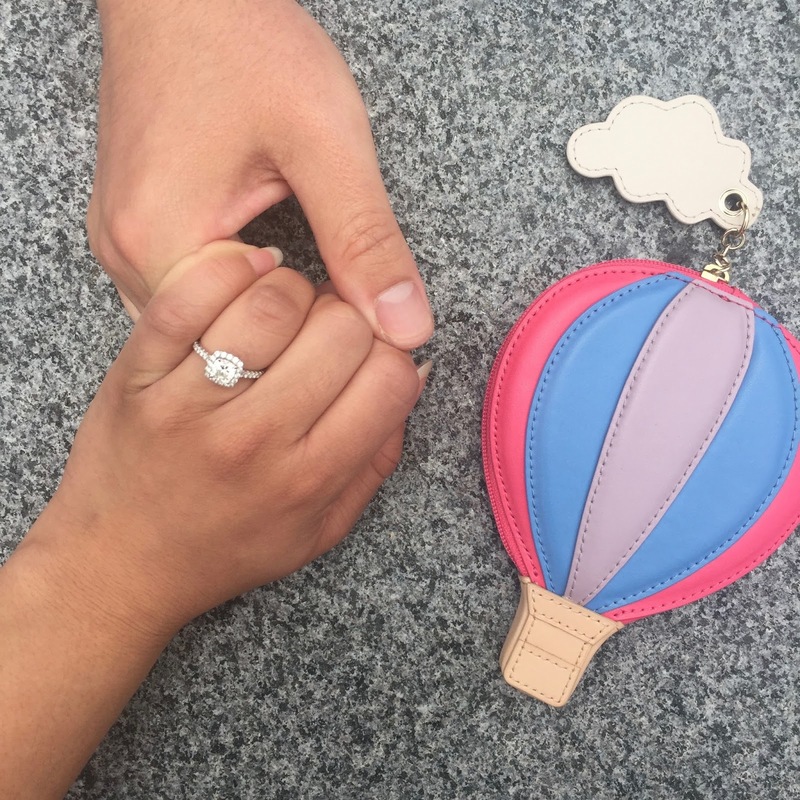 It's been a year since Armando proposed to me, but I haven't had a chance to share on the blog how it all happened. It all started with a purse, Kate Spade purse to be precise. Armando and I stopped by the Kate Spade outlet store in Gilroy on our way to visit our families in Salinas for the weekend. I was browsing the store when I stumbled upon a hot air balloon purse. I had the coin purse in my collection but decided I needed the purse in my life. 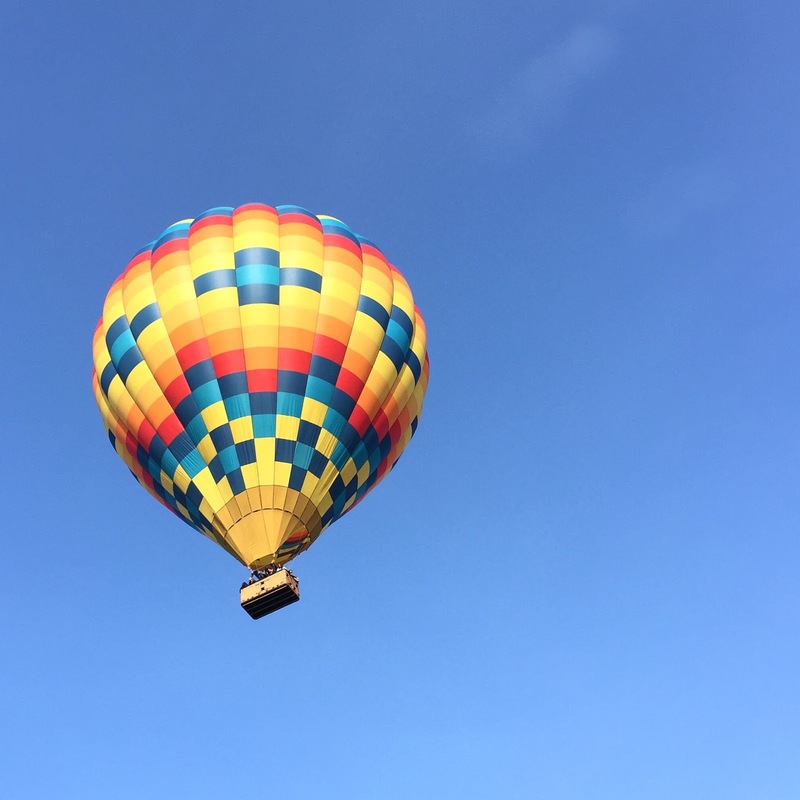 I sold the idea to Armando that it would make a great prop if we ever were to do a photo shoot near a hot air balloon festival. We looked up upcoming festivals in the area when we arrived at my parents' house. We saw a date for the Sonoma Hot Air Balloon Festival, but we never looked into buying tickets or attending a similar festival. A couple of months go by, and I start asking Armando what he would like to do for his 27th birthday. He suggests going on a hot air balloon ride in Napa. He starts doing the research, comparing different companies, and leaves me in charge of finding a place to spend the night since we would be required to be in Napa around 6:00 AM. I found a spot and kept asking what the total was for the balloon reservation so I could reimburse him since it was going to be his birthday present, but he would say, we'll take care of that after. A week after his birthday, we stayed at an inn down the street from the Napa Valley Marriott Hotel. 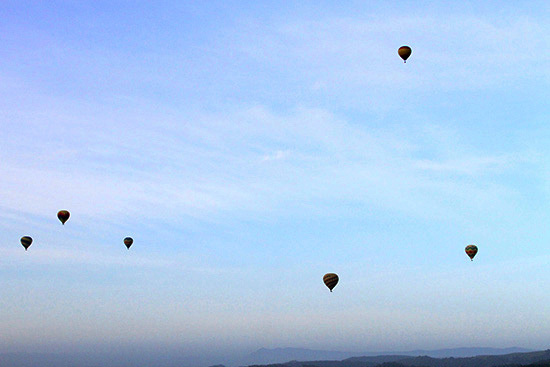 We would be flying at sunrise with Balloons Above the Valley. I remember struggling to wake up and Armando insisting I get ready because we could not miss our flight. We arrived at the Marriott hotel, with coffee in hand, to check in. Once we signed our waivers, we were told we would have a balloon all to ourselves. It struck me as odd we would be that lucky, but I didn't think much of it when Armando also commented on how crazy it was we lucked out. 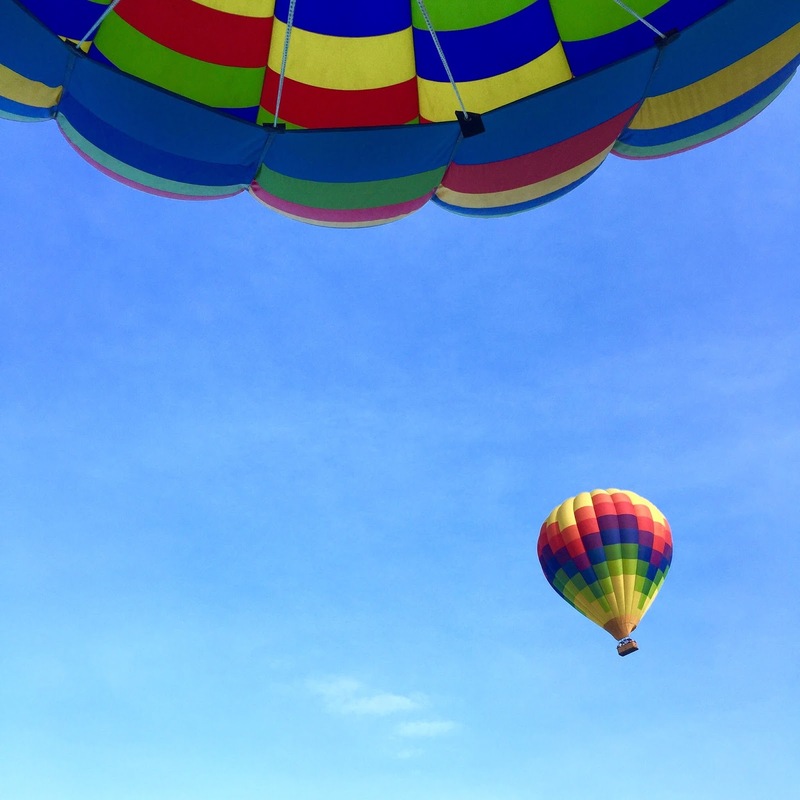 After enjoying a few pastries, we were shuttled to the fields where 3 balloons were waiting. Ours had a small basket, while the other 2 had large baskets ready to carry over 16 passengers. We had our photos taken before boarding the balloon by the attendants and then, we were off! 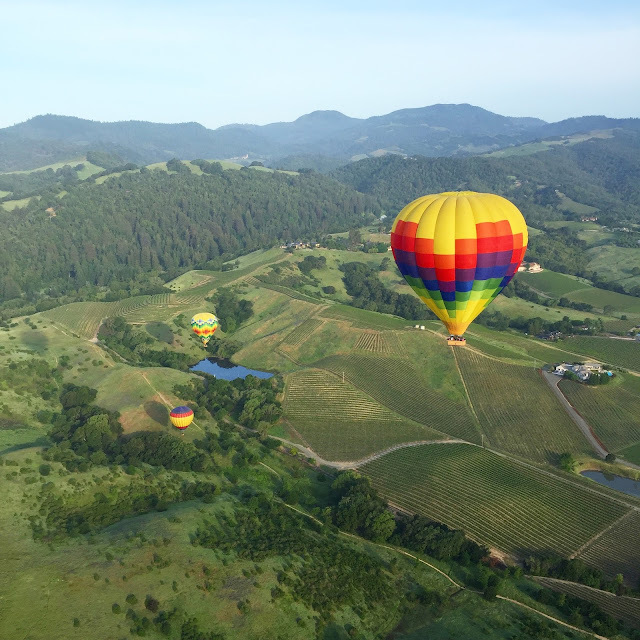 We flew up to 2,000 feet in the air over different vineyards of Napa Valley. Our balloon was piloted Bob, the owner of Balloons Above the Valley, and he would share points of interest with us. Armando had his GoPro setup recording our flight while I focused on using the DSLR camera and my iPhone for shots of the other balloons. I witnessed an amazing sunset that morning. Everything felt so peaceful and as we were looking at the sunrise, Armando pulled me close and I put my camera down as he started to say something. And then the pilot released more hot air into the balloon, which prompted Armando to start over again. I don't remember the exact wording, in part because I was in disbelief that this was happening, but when he got down on his knee in our small basket and pulled out a box with a ring, I felt the tears well up and my hand covered my mouth in shock while I kept asking "Are you serious?" All of this caught me by surprise and I couldn't believe today was the day Armando had planned on asking me to marry him. Of course, I said yes. Our balloon landed 20 minutes later, but my head was really still in the clouds still trying to process everything. Armando seemed pretty happy, despite his GoPro failing to record the exact moment he proposed, but I think it's only meant for us (and Bob) to remember. We returned to the hotel for our post-flight brunch before we set off on our next adventure to announce the engagement to our families that weekend. And that's our engagement story.